In February 2015, Online platform on community-based services in Serbia was recognized as one of 39 “Innovative Practices 2015” at the 2015 Zero Project Conference, an international summit on independent living and political participation, held at the United Nations offices in Vienna.The platform was established under project “Community based services for persons with disabilities” (November 2012-June 2014), implemented by Youth with Disabilities Forum in Serbia. The project was funded by European Union under civil Society Facility programme. 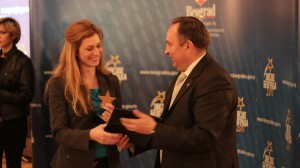 Agency for European Integration and Cooperation with Associations in the City of Belgrade, presented the Forum with the award “Belgrade Stars 2011” and “Belgrade Stars 2012” for the best-undertaken projects, supported by the city of Belgrade, within the area of social protection. Belgrade organization “Coloseum”, on the International Day of Persons with Disabilities, awarded YDF with a Letter of thanks for the remarkable achievement in regards to the position of people with disabilities in Serbia in 2009. Disability Shooting Federation of Serbia (ISSS) awarded our organization with a plaque for outstanding contribution for shooting of persons with disabilities in Serbia, in 2008. In 2008, Youth with Disabilities Forum received a special award from the Ministry of Labor and Social Affairs for extraordinary results in working with people with disabilities.